The MMO selling power of the DC Comics roster has been proven in just a couple of weeks. 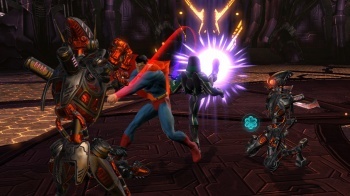 Early reports coming out of Sony Online Entertainment indicate that DC Universe Online was a strong bet for the company. The DC Comics MMO is the fastest selling game released by SOE to date. This doesn't mean it's the biggest selling, and still has a ways to go to unseat previous SOE titles such as Everquest and Star Wars: Galaxies in that department, but its first two weeks of sales have apparently gone well. SOE president John Smedley recently tweeted: "Working on out-of-stock problems for DCUO. It's out fastest selling game ever. Should have more inventory in Monday." He later corrected "out" to "our," blaming his phone. Smedley also revealed that DC Universe Online was #1 in sales on Steam last week, showing that the game is finding an audience both at retail and through digital distribution. DC Universe Online was released on January 11 and is evidently catching on with both MMO and comic book fans that want to live out their dreams of becoming Batman's sidekick and chit-chatting with Superman. The game takes players into cities like Gotham and Metropolis where they hob-nob with these DC heroes while creating a mythos of their own. You still have to kill "X" of this and collect "X" of that, but hey, at least you get report back to the Man of Steel this time. SOE chose to bring the MMO to both the PC and PlayStation 3, which Smedley reveals has been a major boon. The console crowd are buying more copies of the game than PC players, with a sales split of 52% on PS3 and 48% on PC. Now we wait to see if DC Universe Online has legs past one month, which is the typical drop-off period for MMO players that get sick of a new title and go back to playing more World of Warcraft, and when some of those new console MMO players will realize their free month is over.